I love breakfast. It is my favorite meal. I can eat breakfast at any time of the day. And I love all kinds of breakfast foods: eggs, cereal, pancakes, waffles, french toast, hash browns, bacon (and boy, do I love bacon) and other breakfast meats…I think you get it. I recently had breakfast with some friends and we decided we wanted to make waffles. I have never made waffles before, but one of my friends had and we had a waffle maker, so we decided to try it. I drove to my friends’ place with my waffle iron and set to work making the waffle batter using a recipe we found online. At one point we realized that we didn’t have any baking powder, which the recipe called for, but only had baking soda. Being the lazy people we are, we contemplated whether I should go to the store to buy baking powder. My friend thought that we could just use baking soda. I wasn’t so sure since I know certain recipes call for one or the other. Since none of us knew for sure, I decided to consult the internet to answer that question. And so began the lesson in the chemistry behind leavening agents and the difference between baking soda and baking powder. I found an article on the site About.com which explained the difference between the two and when and why a recipe calls for other over the other. It seems that the process of making something rise is based on a simple reaction of an acid, a base and moisture to produce carbon dioxide which causes the rising. The interesting thing is that you use either baking soda or powder based on the other ingredients in the recipe. Baking soda is a base made up only of sodium bicarbonate. So in order for it to cause something to rise, there has to be an acidic component in the recipe (some examples given are yogurt, chocolate, and buttermilk). Baking powder, on the other hand, contains both the acid (usually cream of tartar) and the base so it only needs moisture to activate the reaction rather than relying on other ingredients in the mixture to do so. Also, baking soda is bitter and the acidic ingredients in the recipe help counter that taste. Armed with this knowledge, we decided that we would try to make our own baking powder. So again I searched the internet for a recipe and again realized we didn’t have all the ingredients. The baking powder recipes I found called for baking soda, cream of tartar and cornstarch. We only had the baking soda in the cupboard, but we were determined to make this work (and try as hard as we could to not have to go out to buy baking powder). Since the reaction relied on the action of an acid, base, and moisture, we figured any acid would work. All we had was vinegar so we figured we’d give it a try. We had no idea how much vinegar to add but one of us somehow determined how much (just poured it in to make a paste). 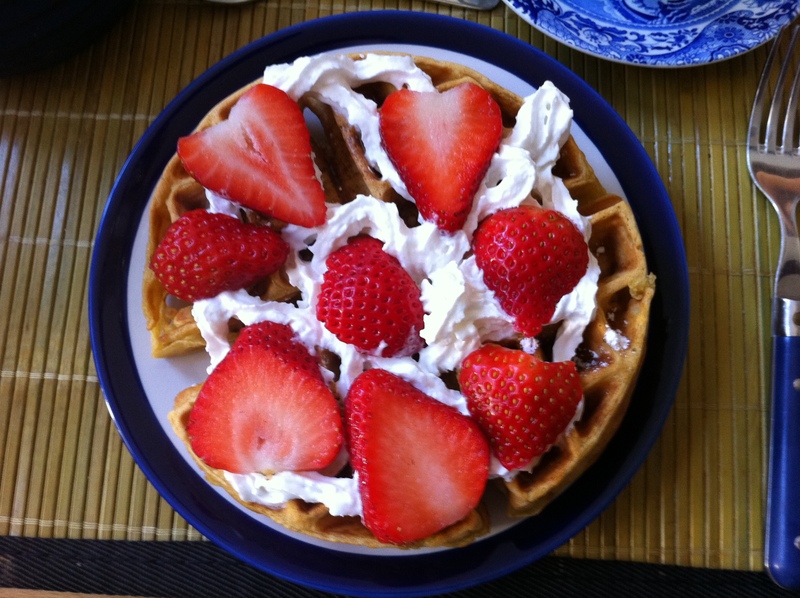 We added it to the mix, crossed our fingers and hoped that it would all turn out ok.
And the waffles pretty much did. The only problem was that when we bit into some areas of them, they were very bitter tasting. We noticed that when mixing our version of the “baking soda” it got clumpy and we couldn’t really mix it well into the batter. This could explain why we would get bites of really bitter tasting waffle. It also could be that the “acid” component we put in didn’t cut the bitter taste of the baking soda as it is supposed to. But all in all, they turned out pretty good and they did rise. And with strawberries, syrup, powdered sugar and whipped cream on top, they weren’t too bitter. Those waffles were tasty, but you’re right, we learned our lesson on that one. After reading your post, I looked up substitutions for baking powder again, and found that 1 teaspoon baking powder also equals 1/4 teaspoon baking soda plus 1/3 cup molasses. How much do you want to bet that we could have found an abundant amount of molasses that morning? I wonder if it would have tasted less bitter than the vinegar. Thanks for the review…this is my kind of blog! I’m looking forward to the next post! It’s too bad I couldn’t find that recipe that morning. I am sure we would have found molasses in the cupboard and you are probably right that it would have tasted less bitter. It’s something for us to try next time. We’ve got a lot more experimenting to do with waffle making (which I’m sure we are all very happy to do).